A year and a half after Google and Temasek’s first assessment of the SE Asia digital economy, a new report shows the region growing significantly faster than predicted. The report touches on neither books nor ebooks, but this study represents major opportunities for publishers, distributors, retailers and authors, both within the region and beyond. will be home to 330 million active internet users … For over 90 percent of those users, a smartphone is their preferred method of accessing the web – underlining the seminal role that mobile devices will continue to play in the region’s future economic growth. The SE Asia online economy will hit a valuation of $50 billion by end of 2017, rising to $200 billion by 2025. Of the current $50 billion, some $6.9 billion is spent on entertainment. If the ratio holds that will mean a SE Asia digital entertainment spend of $27.6 billion by 2025. Much of that will be video and games, of course. Books and ebooks? Not so much. But bear with me. E-commerce in SE Asia is growing at 41% CAGR. To understand what that means for the future, take a look at this chart showing the 2017 level and the prediction for 2025. …Southeast Asian consumers spending an average of 140 minutes every month on the each of the region’s two leading local ecommerce sites (the report doesn’t name these, but they are presumably Alibaba-owned Lazada and Sea-owned Shopee) … By comparison, US consumers spend an average of 80 minutes per month browsing their country’s top ecommerce site (again, this wasn’t explicitly identified, but is presumed to be Amazon). And that is the perfect starting point for looking at the publishing opportunity. Amazon. Or rather, the absence of Amazon. While we in the west tend to think of Amazon as a global player, the reality is Amazon is a bit player or unknown in much of the world. In SE Asia Amazon has only this year ventured into the region (AWS and video-streaming aside ) with a token presence in Singapore, and books, let alone ebooks, are not a feature of Amazon SG. Might that be because SE Asian nations are among those countries we are constantly told “don’t read”? Yet Popular’s Malaysia BookFest (July – check out this Facebook video) and Singapore BookFest (starts this week) regularly get over half a million visitors each. SE Asians don’t read? 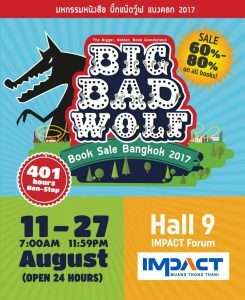 The Big Bad Wolf sale in August in Thailand’s capital Bangkok was a 17-day 24/7 book-sale event with 3 million books on sale. The Big Bad Wolf Sri Lanka incarnation in October offered 1.5 million books. Big Bad Wolf Indonesia had 2.5 million books on offer. The Big Bad Wolf Malaysia 2017 event is live as I write this (Dec 8-18) and 4.5 million books are on offer during the 257-hour non-stop event. As well as the Malaysia Big Bad Wolf sale, Malaysians will also have been attending the Kuala Lumpur International Book Fair in April. The KLIBF regularly sees over 2 million visitors, and this year hit 2.5 million, making it one of the world’s biggest book fair players by visitor count. Across the SE Asia region book fair attendance varies, from the 70,000 that attended the Jakarta Fair in Indonesia to the 150,000 that attended the 2017 Manila Fair in the Philippines to the one million that regularly turn out for the Ho Chi Minh City Book Fair in Vietnam. Now let’s take a step back and look at the bigger picture. Traditional book selling through bookstores has never been a major part of the SE Asia literary scene. The logistics of analogue distribution simply does not work in that model’s favour. Just yesterday I reported here at TNPS on Singapore’s biggest bookstore chain, Popular, talking about a “stagnating” book market. Online book sales are not too impressive right now in the region because of the need for credit cards to pay, although that barrier is slowly disintegrating as more mobile wallet solutions become available. Yet the evidence is plain to see that books are becoming ever more popular, and book fairs and events are getting bigger and better each year thanks to social media spreading the word. Thailand’s amazingly successful Ookbee ebook store shows clearly how ebooks can be popular when made available, but until publishers digitise more content there is little reason for SE Asian readers to shift their focus to ebooks. And until more ebook distribution is available (Google Play and Kobo are there but Amazon and Apple are conspicuously absent across the entire region) publishers are reluctant to invest in digitisation. That could change soon. Ookbee currently operates not just in Thailand but also in Vietnam, Indonesia, Malaysia and the Philippines, and earlier this year received a $19 million cash injection from, and entered a joint venture partnership with, the Chinese e-commerce titan Tencent, the east’s biggest ebook player. Tencent has also recently invested $40 million in Wattpad, which also has a strong presence in SE Asia. With SE Asians spending far more time on smartphones than anyone else, and spending almost twice as long on e-commerce sites as Americans, it’s not rocket science to see the possibilities. How much of this anticipated massive growth in the SE Asia digital economy will be shared by publishers, book retailers, book distributors and authors? That is the $200 billion question.